Until recently detecting dangerous gas in slurry pits has involved bulky equipment that needed constant calibrating & charging. This new detector is incredibly small and gives constant protection for a period of two years from the point it is turned on. For normal use keep the detector clipped on to yourself for continuous monitoring or before entering a hazardous area you can simply attach it to a line or pole. 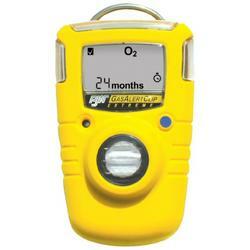 The new H2S gas detector from Merlin Lazer offers the following benefits. Small – No Excuse not to wear. It is a common belief among farmers that it is safe to enter a facility or pit if they cannot smell the putrid, rotten egg odour associated with hydrogen sulphide. This is not necessarily true because high concentrations of hydrogen sulphide paralyzes the nerve cells of the nose to the point where the person can no longer smell the gas. Concentrations of hydrogen sulphide can soar from 5 parts per million (ppm) to more than 500 ppm in seconds after agitation begins and concentrations of hydrogen sulphide above 600 ppm can render a person unconscious after taking only one or two breaths. Hydrogen sulphide is a naturally occurring, flammable gas. It is formed through the decay of organic matter. It is commonly found in areas where raw sewage or animal manure collect. Because it is heavier than air, the gas will collect in confined spaces. At low concentrations, it has a rotten egg smell, but at medium concentrations, H2S is perceived as sweet smelling. At high concentrations or after long-term exposure, the gas cannot be smelled. What Does H2S Do to the Body? At low concentrations and short exposures, H2S is an eye and lung irritant. It causes watering eyes, coughing or a sore throat. As concentration levels or exposure times increase, the irritation worsens and can include headaches and fluid in the lungs. High concentration levels can cause a coma or death within a few breaths.